Preheat oven to 325 degrees F (165 degrees C). Lightly butter a 9x13-inch glass baking dish and set aside. 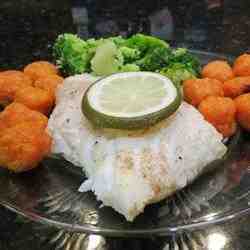 Season the grouper fillets with salt, lemon pepper, garlic powder, and onion powder; place into prepared baking dish. Spread about 2 tablespoons of softened butter over the top of each fillet. Pour in the lime and orange juices, then cover each fillet with 3 slices of lime and 2 slices of orange. Bake in preheated oven until fish is opaque and flakes easily with a fork, about 15 minutes.